The Basilica of San Apollinaire in Classe in Ravenna Italy, was consecrated in 549 AD by Bishop Maximian. The church was dedicated to Saint Apollinaris of Ravenna who was martyred during the purges of either Emperor Vespasian or Nero. 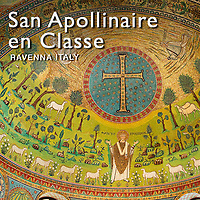 The beautiful Byzantine Roman mosaics of the Basilica of Sant' Apollinaire in Classe are incredibly simple with depictions of Saint Apollinaris and sheep against a green background. The Apse mosaics has a simple cross at its centre below which stands Saint Apollinaris with a flock of sheep on either side making a procession towards him. The metaphor of the sheep has long been a symbol of Christian devotees. The Crucifix has no depiction of Christ being crucified on it and is made up of gold mosaic sitting in a circle filled with gold stars against a blue background. Download Royalty Free stock photos of the mosaics of The Basilica of Sant'Apollinare in Classe or buy as photo wall art prints on line.